This event will put you in the Easter Spirit! 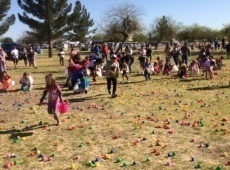 Come out and hunt for thousands of prize filled eggs! There is something for all to enjoy. Enjoy a Pancake Breakfast with Hip Hop the bunny. Prices are $2 for pancakes only and $3 for pancakes and a drink.